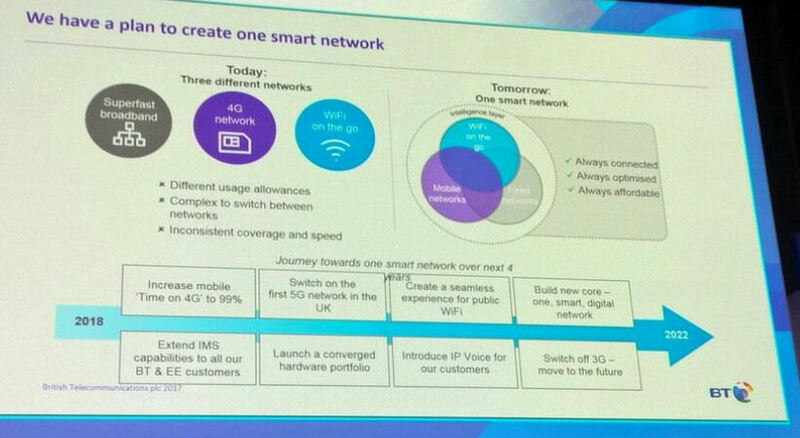 Speaking at the 5G World event in London, BT’s CTIO Howard Watson has essentially made the 2022 target public. The target isn’t a hard deadline, more of a lofty ambition, fitting into the wider network transformation strategy as the business attempts to enter the digital world. “We see 2G and 4G co-existing, but the demand of 3G lessening considerably,” said Watson. As you can see from the slide below, there are a number of objectives over the next four years, one of which is the 3G switch off. Although we are not surprised these conversations are happening inside the BT business, we’re somewhat taken back there hasn’t been more communication with the industry about the ambitions. Of course, BT is not alone. Three has stopped selling 3G devices and is in the process of re-farming the spectrum to boost performance in 4G. Orange hasn’t put any timelines for the switch-off date, but progress is being made. Soon enough 3G will become redundant, partly thanks to the cost-effectiveness of 4G devices, but also because spectrum is a finite (and expensive) resource. Re-farming the spectrum into 4G and 5G is an important process. That said, perhaps this is genuine evidence progress is being made. The fact there are concrete conversations about turning off 3G suggests there is notable progress being made in 5G. Some might assume operators are more talk than walk, but maybe we aren’t giving them enough credit. Hope they make 4g coverage better in rural areas then as can only get 3g in most places.